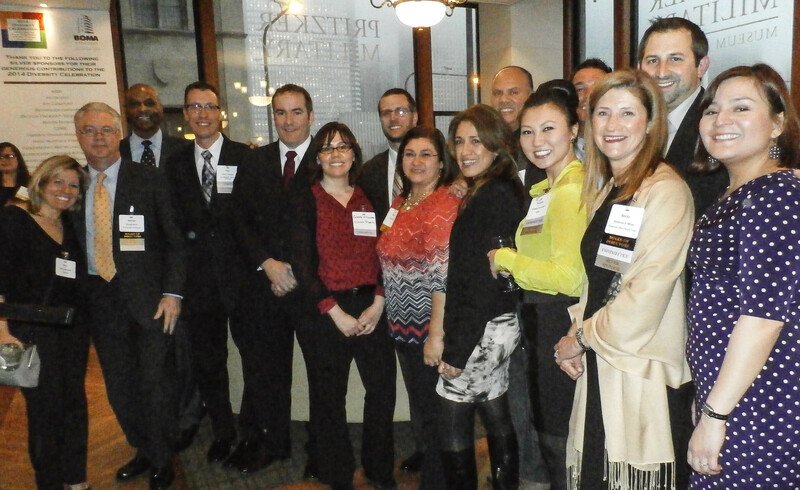 Time and again, BOMA/Chicago members spring to life to support initiatives that strengthen the commercial real estate industry and the professionals who comprise this industry. After 111 years of spearheading projects to advance CRE in Chicago, BOMA/Chicago continues to notice that our members not only rally behind each of our initiatives, but that their support grows with each passing year. The most recent case in point is the tremendous support we received leading up to and during the 2014 Diversity Celebration held on April 3 at the Pritzker Military Museum & Library. The purpose of this annual Celebration is to promote the Reginald L. Ollie Inclusion and Outreach Scholarship and to support diversity in the industry. Due to the hard work of BOMA/Chicago’s Diversity & Corporate Social Responsibility Committee along with patronage of our entire membership, this year’s event was historic for many reasons. The Ollie Scholarship was created nine years ago in an effort to recognize and develop minority leaders in the commercial real estate industry. The scholarship provides full course tuition (a value just under $10,000) to achieve the Real Property Administrator (RPA) designation. Since 2005, at least one minority applicant has been awarded the Ollie Scholarship. Due to the growing pool of Ollie Scholarship applicants and the outstanding qualifications of these applicants, the BOMA/Chicago Foundation approved the Ollie Scholarship Selection Committee’s recommendation to award two Ollie Scholarships in 2014. The decision to award two scholarships is not the only reason the April 3 event was historic. A total of 32 Affiliate and Building Members contributed to the Celebration by helping us raise a record-breaking $46,000 in sponsorship and silent auction/raffle prize donations. The silent auction included a wide-range of items from framed hockey pucks autographed by Chicago Blackhawks champs, Jonathan Toews and Patrick Kane, Vegas getaways, Broadway in Chicago tickets, golf outings and more. Soon after each of our 200 guests settled into the evening with food and drinks provided by ParaMount Events, George Kohl, BOMA/Chicago President and member of the Diversity & Corporate Social Responsibility Committee, kicked off the evening by giving a background of the Ollie Scholarship and thanking each of our sponsors. Kohl then introduced the evening’s honorary guest and namesake of the Ollie Scholarship – Reggie Ollie, a devoted BOMA/Chicago member who served as the Chair of the Diversity Committee for more than 10 years. Reggie took the microphone and described how proud he was to award not one, but two scholarships to rising stars in the industry who hail from a diverse background – Angela Oh and Yordanos Ghdey. 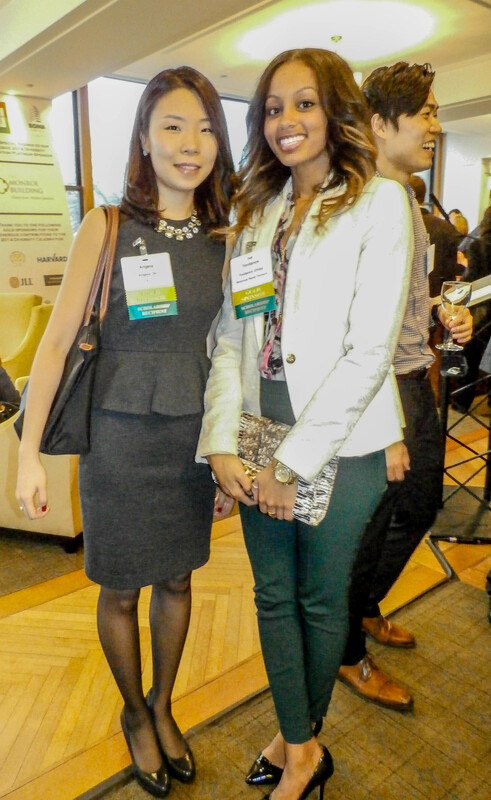 Angela Oh (left) and Yordanos Ghdey (right). Oh, a JLL Property Administrator at 71 South Wacker and Ghdey, a Property Management Assistant for Riverview Realty Partners at 330 North Wabash, took the stage and gave very personal and eloquent acceptance speeches. Oh thanked her entire team at 71 South Wacker for their support and expressed her gratitude for the opportunity to earn her RPA in what she believed to be the strongest CRE market in the world – Chicago. Ghdey also thanked her property management team and noted that she had already received an outpouring of support from our members via email and phone calls to offer their help and mentorship. With the echoes of this quote, Ollie encouraged Oh and Ghdey to earn their RPA and to leave a permanent legacy within the CRE industry. BOMA/Chicago would like to once again thank each member of the Diversity & Corporate Social Responsibility Committee for helping to plan this event, secure sponsorships, collect silent auction donations and for their everlasting commitment to supporting workplace diversity. A special thank you also goes to Brian Staunton, the Diversity Celebration Event Chair, and Paul Rades, Property Manager for J & J ARNACO LLC at the Monroe Building. Rades has generously offered the space for the Diversity Celebration for two years in a row. On top of donating the space, the Monroe Building was also the exclusive Platinum Sponsor of the event and funded the $500 grand prize raffle. This year’s Diversity Celebration was also special in that the speeches given by Oh and Ghdey truly sparked an understanding and a deeper glimpse into why the Ollie Scholarship is so important to BOMA/Chicago and the industry. Oh and Ghdey’s sentiments are reflected in the experiences of the members who comprise the Diversity & Corporate Social Responsibility Committee. Anamaria Spiteri, Business Development Manager at AlliedBarton Security Services, has served on the Committee for two years. As a second generation immigrant, Spiteri states that she understands the challenges that minorities can face in their professional lives and that volunteering on BOMA/Chicago’s diversity initiative is a way for her to help future leaders like herself. Jeff Tigchelaar, Senior Real Estate Manager for CBRE, has sat on the Diversity & Corporate Social Responsibility Committee for the past five years. In attending the recent Diversity Celebration, Tigchelaar realized that in helping to grow a talent pool comprised of people with diverse backgrounds, the industry will be exposed to fresh and innovative ideas. Lourdes Becerra, Marketing Manager at Landscape Concepts Management, has spent one year on the Committee. According to Becerra, she felt compelled to sit on this Committee because she has yet to find another group or association that offers scholarships and opportunities to diverse individuals who want to grow professionally. Becerra touches upon a point that brings much pride to BOMA/Chicago – that we are the only BOMA local in the world to have a Diversity & Corporate Social Responsibility Committee, a scholarship to support diversity and an event solely dedicated to celebrating diversity in the industry. Applications for the 2015 scholarship will be available in the fall of 2014. Please visit the Ollie Scholarship webpage on the BOMA/Chicago website for more information and to learn about the requirements to apply.